Web design landscaping companies Hampton Roads | Another great custom web development by VISIONEFX. This new custom website design features colorful banners, call-to-action navigation and image displays. The website framework is an original custom Word Press design on Linux hosting services on Go Daddy web hosting. The Whole 9 Tree Services has offices in Chesapeake VA. When searching custom Web site design, development Virginia Beach VA look no further than the VISIONEFX web design, development professionals. 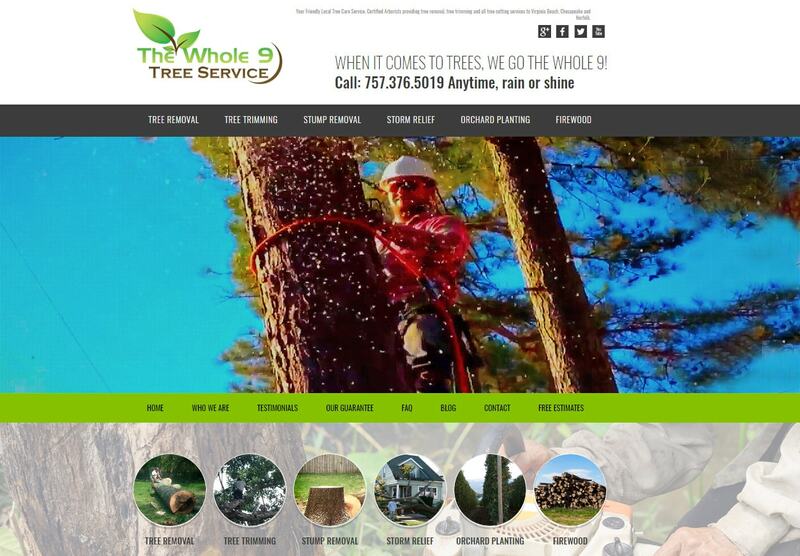 This recent web design Chesapeake VA project for Whole 9 Tree Service provides a competitive branded website presence in a highly competitive space. Take a look at some of our other Chesapeake based web design clients. VISIONEFX, a Web design company based in Virginia provides custom website design services to national companies and small to medium businesses throughout the United States to include; advanced custom Word Press web design, HTML 5 development, E-commerce web sites and product database programming, Word Press Plugin customization, Joomla web development, Search engine optimization and web maintenance services. Call VISONEFX at (757) 619-6456 or email direct to info@visionefx.net. VISIONEFX also has Top Google Reviews posted on Google My Business pages. Read our review and contact our website customers. They will tell you our web design and web maintenance services are second to none.